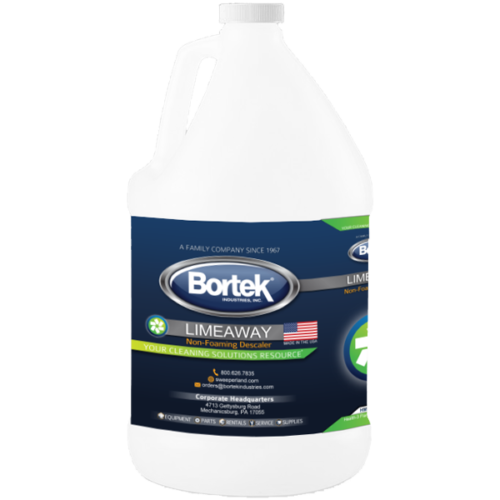 Limeaway- Non-Foaming Descaler- Bortek Industries, Inc. 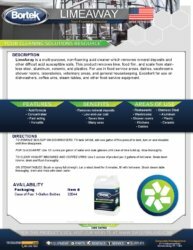 Remove buildups of lime and mineral deposits in food service areas and beyond with this multi-purpose, non-foaming acid cleaner. A multi-purpose, non-foaming acid cleaner which removes mineral deposits and other difficult acid susceptible soils. This product removes lime, food film, and scale from stainless steel, aluminum, ceramic, and plastics. 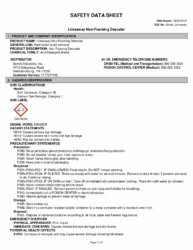 For use in food service areas, dairies, washrooms, shower rooms, laboratories, veterinary areas, and general housekeeping. Excellent for use on dishwashers, coffee urns, steam tables, and other food service equipment. 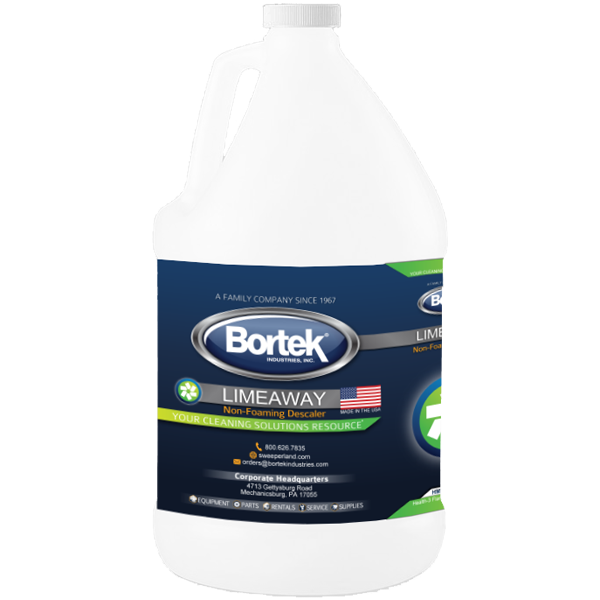 TO REMOVE BUILDUP ON DISHWASHERS: Fill tank 3/4 full, add one gallon of this product to tank, turn on and circulate until lime disappears. FOR GLASSWARE: Use 1/2 ounce per gallon of water and soak glasses until clear of lime build up, rinse thoroughly. TO CLEAN YOGURT MACHINES AND COFFEE URNS: Use 3 ounces of product per 2 gallons of hot water. Swab down interior, drain and flush thoroughly. ON STEAM TABLES: Brush or spray full strength. Let product dwell for 5 minutes, fill with hot water. Brush steam table thoroughly, drain and rinse with clean water. Weight per Gallon 10.39 lbs./gal.